At Bebington Glazing, we truly believe that 'first impressions count'. For this reason, we insist in supplying you with quality composite doors that will leave at last impression in the minds of your guests, neighbours, family, and friends once they have visited your Liverpool home. Specifically, we offer you flush fitted composite doors that reflect your home's true beauty. All composite doors we supply are composed of high-quality materials meaning your composite doors will look new and refreshing for many years to come. Our composite doors are designed to suit most tastes. For instance, we supply composite doors in several colours and finishes. We believe your composite doors should reflect your aspirations and your lifestyle. 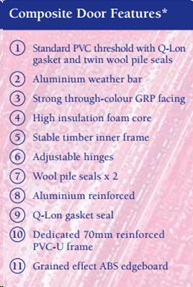 For these reasons, we supply composite doors in a variety of colours and finishes. This includes woodgrain finishes for the more conservative homeowner. Or perhaps you will prefer to opt for one of many bespoke shades you can request via our showroom. At Bebington Glazing, we truly believe our composite doors are unrivalled in terms of both aesthetics and performance. All composite doors we supply come fitted with superior weather-tightness. This means you and your family receive maximum protection from the outside weather. To meet our high durability standards, we only supply composite doors made from robust through-colour GRP door skins. This means the composite doors you supply are utterly resistant to scratches, knocks and harsh weather. And unlike cheaper models, our robust composite doors will not split, twist or warp over time. Furthermore, our composite doors are rated with a U-value of 1.8W/m²K or below. What does this mean to you? It means your energy bills are kept to a minimum and your home is kept nice and warm all year around. All doors are also fitted with a powerful foam core. This also helps reduce energy bills and keep unwanted noise from entering into your home. Because our composite doors are made from highly robust and durable materials, they require only minimal maintenance. For instance, there is no need to paint or varnish our composite doors. All you must do to keep your composite doors looking fresh is carry out an occasional wide with a damp cloth. At Bebington Glazing, we insist on providing you with composite doors that are aesthetically pleasing and utterly secure. Around 70% of all burglars manage to enter a property via the front door. For this reason, the composite doors we supply come fitted with quality multi-point locking systems. This helps keep your home utterly secure from those with bad intentions. All composite doors we supply are designed with a reinforced door frame. Doors are fitted with a two finder bolt, a deadlock and premium adjustable hinges. Our composite doors are also manufactured in accordance with the Police-backed accreditation known as 'Secured by Design'. Bebington Glazing employs a team of experienced glazing designers. Part of their work involves designing stunning glass panels to fit into your composite doors. We offer you a wide variety of glass panel designs, and we may also produce custom panels on request. All glass panels are hand-crafted and offer unique glazing designs. Glass panels are available in a multitude of designs, from traditional to modern styles. We believe the glass panel provides the focal point for your composite doors. For this reason, we have gone to extraordinary lengths to ensure your glass panel looks just right. We offer you a variety of sandblasted 'etched' designs as well as 'colour fused' glass panels. All glass panels are manufactured in accordance with BSEN 1279 standards. Panels are available in both triple and double glazed options. Both sorts of glazing offer you superb heat retention properties. Furthermore, all panels sport a 'beveled' design to allow ease of cleaning. At Bebington Glazing, we understand each customer has individual needs and requirements that may be unique. For this reason, we offer you bespoke composite doors that will give your home that unique and special character. 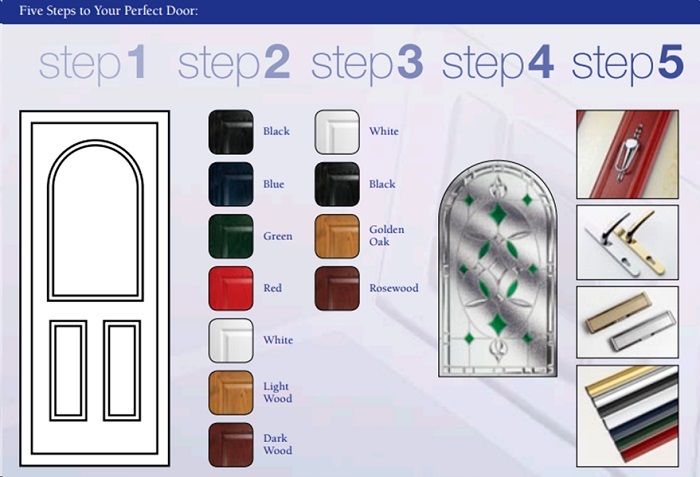 We allow you the ability to tailor your composite doors from a wide variety of finishes and colours. We offer your composite doors in over seven standard colours. These finishes include dark and light wood, as well as the popular 'heritage' shades such as grey, olive, and cream. You must then decide on your ‘door style’. This includes both glazed or solid. Then you must choose the glazing panel style. Our glazing experts will help you select each option that is perfect for your home. Composite doors were introduced to address the flaws of uPVC and timber doors. Composite doors eliminate many of the flaws that arise from both uPVC and timber doors, and this alone justifies the higher price you must pay to install composite doors. Unlike uPVC and timber doors that are constructed of a single material, composite doors are ‘composed’ of many different materials such as PVCu, timber, Glass Reinforced Plastic (GRP), fiberglass and polyurethane foam. When compressed together under high pressure, these materials offer properties that eliminate many of the problems presented when doors are composed of a single material. Why buy composite doors for your Liverpool home? If you are considering buying composite doors, you may wonder why composite doors are worth buying in the first place. Here, we provide a compelling answer to this question. We provide convincing and practical reasons why composite doors outperform both uPVC and timber doors. Composite doors are much more energy efficient than softwood alternatives. In fact, composite doors are around 9 times more energy efficient when compared to softwood doors. Composite doors also beat timber doors when it comes to maintenance. Unlike timber doors, composite doors will not fade or crack with aging. Composite doors are coated in coloured GRP which requires zero maintenance on your behalf. Composite doors are filled with insulating foam. This makes composite doors much more energy efficient than both timber and uPVC doors. Also, unlike timber doors, uPVC doors are not going to warp, shrink or expand over time or when they are exposed to dry or wet conditions. Why are composite doors in Liverpool more expensive? Composite doors are more expensive than uPVC and most wooden doors because of the material that is used during the manufacturing process. These materials are essential because they improve the energy efficiency and durability of composite doors when compared to wooden and uPVC doors. These materials include fiberglass and thermal foam injected within the core of composite doors. Can composite doors be painted? We do not advise you to paint your composite doors. The door colour will run through the skin of your composite door during the manufacturing process, and not merely painted across the outer surface. This means the colour of composite doors does not fade with aging. All you must do to maintain your composite doors is to clean them with a sponge. You are also advised to regularly oil the door hinges. How warm are composite doors? When purchasing composite doors, you must be aware that not all composite doors are created equally when it comes to energy efficiency. When you purchase composite doors from Bebington Glazing, we educate you on the various models of composite doors available at different price points. This allows you to make an informed buying decision. Essentially, composite doors with a foam filled core and a uPVC edge band improves the energy efficiency of composite doors. These features offer a 20% energy efficiency improvement when compared to timber doors. Many people looking to invest in composite doors may already have installed uPVC doors. You thus may wonder what the key differences between composite and uPVC doors may be. The key difference between the two is material. uPVC doors are plastic through and through. In contrast, composite doors are composed of many different types of materials. These materials are pressed and glued together using pressure. The materials that are used to produce composite doors are strategically selected due to their properties. Together, these materials eliminate many of the problems that occur when doors are composed of a single material such as timber or plastic. Also, composite doors are thicker than uPVC doors. uPVC doors are typically 28mm thick, whilst composite doors are typically 44mm thick. Also, composite doors offer enhanced security features when compared to uPVC doors. Composite doors are built with a super tough structural frame. The frame is further enhanced using a glass-reinforced plastic. Composite doors also wins when it comes to design choices. uPVC doors are available in golden oak, white and rosewood. In contrast, composite doors are available in many different colours including black, red, green, blue, oak, rosewood and white. Can composite doors be made to measure? All styles of composite doors we supply may be made to measure. Simply provide us with the desired measurements and we shall ensure your composite doors are made exactly according to your requirements. Alternatively, contact us today to arrange for our representative to visit your property to ensure these measurements are correct before your doors are manufactured. The key disadvantage of composite doors is cost. Whilst a uPVC door costs around £400, a composite door will cost around £700-£1000. However, composite doors offer energy efficiency advantages over both uPVC and timber doors. This means you will save money in the medium term when you invest in composite doors because less heat will escape from your home. This means composite doors essentially pay for themselves over the duration of their lifespan. How secure are composite doors? Around 70% of burglars gain access to properties through the front door. This means it is essential for you to invest in a front door that offers maximum security. All doors offered through Bebington Glazing meet the ‘Secured by Design’ directive. The specifications outlined in this directive were recommended by a consultation between the police and UK door manufacturers. These features reassure you that your composite doors will prevent burglars from entering your property. This gives you added peace of mind that your property is protected whilst you are away from your property. Contact Bebington Glazing today on 0151 645 3830 or connect with us via this website and a member of our team shall reply to your enquiry shortly.